In the crazed world that is major college football recruiting, there should never be anything that is considered a surprise. Still, when a prospect commits to a school without ever having visited, it raises a few eyebrows. That's precisely what happened with Ohio State and four-star defensive tackle Haskell Garrett. Garrett, a star at Bishop Gorman High School in Las Vegas, pledged to the Buckeyes without ever stepping foot on campus. Nearly a year later, Ohio State signed the nation's sixth-ranked defensive tackle. And there was never really any doubt about it. Garrett racked up offers early in the recruiting process from some big-time programs: USC, Texas A&M, Oklahoma and Penn State to name a few. But when Notre Dame offered in December of 2015, Garrett declared the Fighting Irish to be the leader in his recruitment. 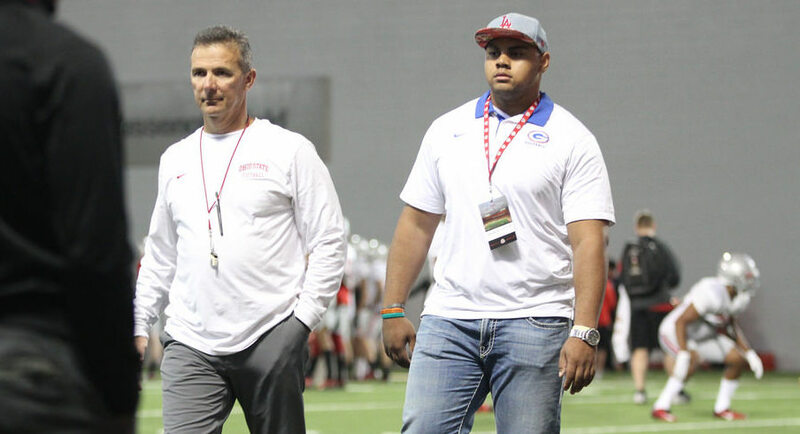 Ohio State wide receivers coach Zach Smith — the Buckeyes' lead recruiter in Las Vegas at Bishop Gorman — visited Garrett in late January, however, and the 6-foot-2, 288-pounder was extended a scholarship offer just a few days later. One week after Ohio State offered, despite saying Notre Dame was his leader, Garrett shocked pretty much everybody when he verbally committed to the Buckeyes. Ohio State wasn't the only school not to receive a visit from Garrett at this point, however. Garrett told Eleven Warriors shortly after his pledge to the Buckeyes he hadn't visited any school. "After I got off the phone with (Urban) Meyer, that's when I knew I wanted to commit to Ohio State. Just knowing his resume, his history of winning games, and how he's getting dudes ready for life, whether as a man, for the NFL or to whatever the next step in life is, that was it. He really prepares them in a good way and I wanted to try and stay closer to my family in the east, and to play for a big-time football team. That’s what makes Ohio State the best place for me." The visits came shortly thereafter. Garrett attended USC's junior day just a few weeks after he committed to Ohio State and then he visited Notre Dame in mid-March before visiting Columbus the next day. Garrett visited for one of the Buckeyes' spring practices on March 20 and Meyer made sure he spent plenty of time with one of his newest pledges to the star-studded 2017 class. Urban Meyer and Haskell Garrett during Garrett's first-ever visit to Ohio State. It was pretty much a wrap after Garrett's first visit to Ohio State, though, as the four-star prospect essentially shut down his recruitment. The Buckeyes landed a pledge from a top-100 player from the west coast without him visiting campus first and held onto Garrett throughout the entire process. That's rather impressive. Garrett visited Ohio State twice in the fall — for the Northwestern and Nebraska games — and he will be on campus for good in June with the rest of the Buckeyes who are not early enrollees. Rarely in major college football recruiting does the process go the way Garrett's did. Ohio State is certainly thankful it did. The Buckeyes figure to have landed a mainstay on the interior of the defensive line for the foreseeable future.